LoGee-10 Special Price only $199.95! 3.35" x 2.2" x 1"
Tri-Axial shock recorder, up to 120 day battery life. NEW! All loggers also have temperature recording. Online Ordering at bottom of page. The HiGee/LoGee are ultra-small, ultra-light, 3-axis, battery powered, stand-alone, programmable shock recorders. These low-cost recording devices measure and records the peak acceleration levels to which it is exposed, along with their time of occurrence. The HiGee is designed for documenting dynamic environments such as packages,moving vehicles, trains, containers, ships, etc. The device is also useful in characterizing environments such as production and assembly lines of delicate electronics, IC fabrication, communications and computer components. During operation the HiGee can measure and record up to 16,000 (64,000 LoGee-10) time-tagged peak acceleration levels per axis. Once activated the HiGee senses and records the peak acceleration levels that occur within adjacent "time bin" periods. The bin period is selectable from 1 second to 12 hours, (continuous logging at up to 100 hz is also possible) At the end of each bin period, the highest acceleration sensed within that period is stored. HiGee's data recorder software is an easy to use Windows-based software package that allows the user to effortlessly collect, display and analyze data. The HiGee software and cable starter kit is included with HiGee data loggers. Also available: LoGee 10 which is the same as the as the HiGee, except it has a reduced acceleration range of -10G to +10G, and 3 axis, but a higher acceleration resolution, longer battery life and extended memory (64,000 data points), and works in static acceleration environments. Acceleration Calibration: Digital calibration is available through software. (Time Bin Period): 100 per second to 2 per day, selectable through software. until device is in place. Real Time Recording: Future feature. All loggers eligible for free future firmware updates. Memory: 16,000 peak acceleration readings or 16,000 peak acceleration readings per channel (LoGee 10 64,000). Power: User Replaceable Battery, up to 120 days or 2880 hrs at lowest setting. Ships with required batteries. Data Format: Date and Time stamped, X, Y, Z - G Force. To order use our easy to use online ordering or call us at 269-365-7744 between the hours of 9-5 Eastern Standard time. Shipping is added to order. 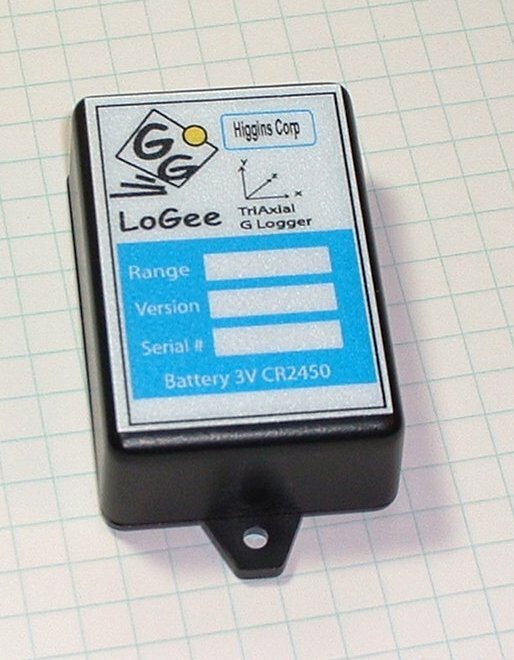 Note: HiGee LoGee software and cable starter kit is included with HiGee/LoGee data loggers.